The SFM3400 flow sensor is a proximal flow sensor that has been specifically designed to be used for both neonatal and pediatric respiratory devices, such as those utilized to provide ventilation or anesthesia to patients. Available as both a single-use version (SFM3400-D) and a reusable version (SFM3400-AW), the SFM3400 is a reusable solution that is both autoclavable and washable. The SFM3400 flow sensor features an impeccable measurement accuracy, short signal processing time and an outstandingly high robustness. Equipped with a digital flow sensor capable of measuring bidirectional flow rates of up to 33 slm, the SFM3400 is fully calibrated for air, N2 and O2 gases. The special design of the flow channel ensures that a low dead space volume of less than 1 ml remains throughout the full-service life of the sensor. Additionally, this sensor also comes with a standard series of medical cones that allow for pneumatic connection to the respiratory cycle. With a user-friendly mechanical interface, the SFM3400 can be easily connected to ventilation devices in the medical setting. The SFM3400 mass flow meters are ideal solutions for the proximal flow measurement required in both neonatal and pediatric OEM applications, as well as for other ventilation purposes required in hospitals, emergency situations and home care applications. Similar to other Sensirion’s other sensors, the SFM3400 utilizes the innovative CMOSens® Technology that combines the sensor element and processing electronics onto a single small CMOS microchip. 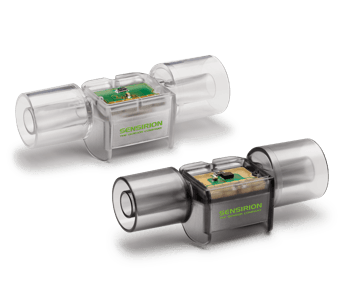 By utilizing the CMOSens® technology, the SFM3400, as well as all other Sensirion mass flow sensors, offer users the ability to achieve robust and interference-free measurements, all the while maintaining a rapid and precise sensor signal.